1. Holst JJ.The physiology of glucagon-like peptide 1. Physiol Rev 87: 1409–1439, 2007. 2. Toft-Nielsen MB, DAMHOLT MB, MADSBAD S et al. Determinants of the Impaired Secretion of Glucagon- Like Peptide-1 in Type 2 Diabetic Patients J Clin Endocrinol Metab. 2001, 86(8): 3717-23. 5. Dunning BE, Foley JE, Ahrén B et al. 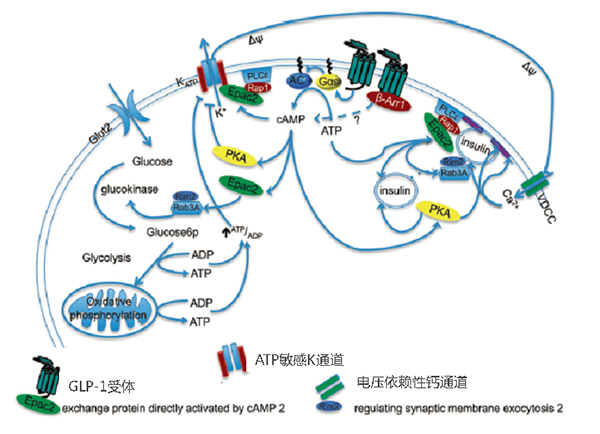 Alpha cell function in health and disease: influence of glucagon-like peptide-1. Diabetologia. 2005, 48(9): 1700–1713. 6. Smilowitz et al. Glucagon-like peptide-1 receptor agonists for diabetes mellitus: a role in cardiovascular disease.Circulation. 2014;129(22):2305-2312.】【Kalra S, et al.Glucagon-like peptide-1 receptor agonists in the treatment of type 2 diabetes: Past, present, and future. Indian J Endocrinol Metab. 2016;20(2):254-267. 7. Gupta.V. Glucagon-like peptide-1 analogues: An overview. Indian J Endocrinol Metab. 2013;17(3):413-421. 8. Farilla L, Bulotta A, Hirshberg B et al. Glucagon-Like Peptide 1 Inhibits Cell Apoptosis and Improves Glucose Responsiveness of Freshly Isolated Human Islets.Endocrinology. 2003 Dec;144(12):5149-58. 10. Pabreja K, Mohd M A , Koole C et al. 11. 陈寒蓓, 林宁, 苏青. 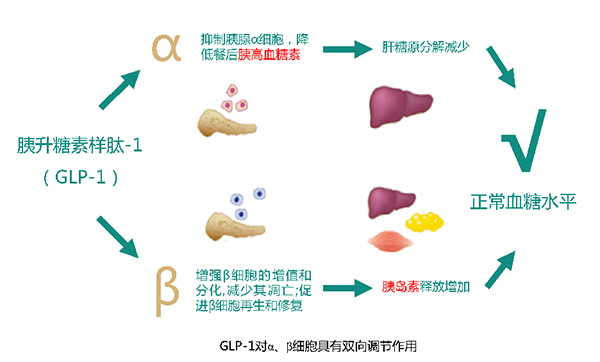 GLP-1 类似物的葡萄糖浓度依赖性降糖机制研究. 中国现代医学杂志.2013, 23(15): 15-18. 12. Kjems LL, Holst JJ, Vølund A et al. The Influence of GLP-1 on Glucose-Stimulated Insulin Secretion. Diabetes. 2003, 52(2): 380-386.
diabetic patients. Diabetologia. 1993, 36: 741-744.